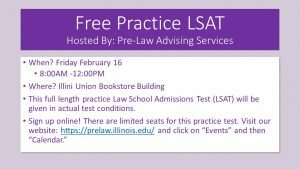 Practice LSAT–Friday, Feb. 16, 8:30 am to 12:00 pm. We only have a few seats left, so register soon. This practice LSAT opportunity features an actual, previously administered LSAT in a realistic, timed testing environment. Seating is limited. Test details and location will be emailed to registrants before the exam. Go here to register. Indiana University McKinney School of Law in Indianapolis is now accepting applications on a rolling basis for its new Pathway to the Law program, featuring online for-credit courses, LSAT assistance, a $2000 scholarship, mentoring, and more for selected applicants. Click here for more details. Business Career Fair–Jan. 31-Feb. 1. For more details visit their website here. Need to draft or improve your resume? Want to learn interview skills or tips on job/internship searching? Use the Career Center’s resources; find their workshop and resource information on their website here! When is the LSAT Prep Fair? 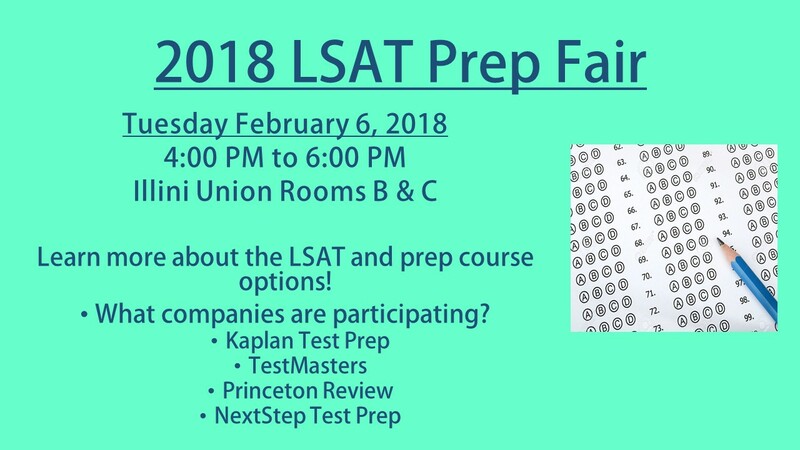 On Tuesday February 6, 2018, Pre-Law Advising Services will be hosting our annual LSAT Prep Fair. The event will be in the Illini Union Bookstore Building, Room 514 and will run from 4PM to 6PM. This is a great event that is only offered once a year! The event is open to the public. Freshmen and Sophomores: Find out what’s on the LSAT and how to prepare for it! Join us for mini-workshops by experts about LSAT content. Have some snacks and talk to different LSAT prep companies about how you can plan ahead to maximize your LSAT performance! Juniors, Seniors, and Alumni: Learn about the LSAT and figure out which LSAT prep option is best for you! Online? Classroom? One-on-one tutoring? Do you want to take a three month class? Six months? One weekend? Talk to different LSAT prep companies about their most effective class formats for you. 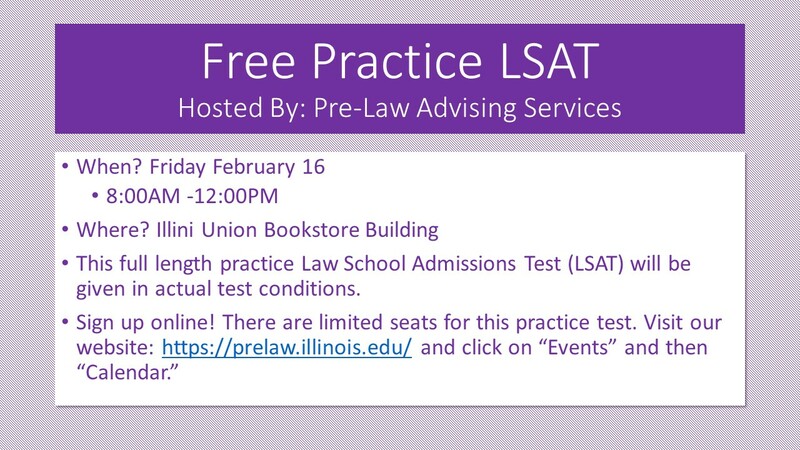 All participants will receive LSAT prep class discounts! We will also raffle off some scholarships and other great prizes. 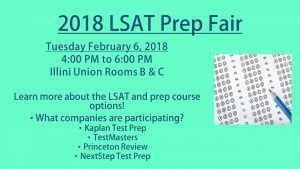 Why should YOU attend the LSAT Prep Fair? Planning ahead for the LSAT is very important. Prep courses are often expensive and time consuming. You want to make sure you choose a LSAT Prep company and course that is the best fit for you. 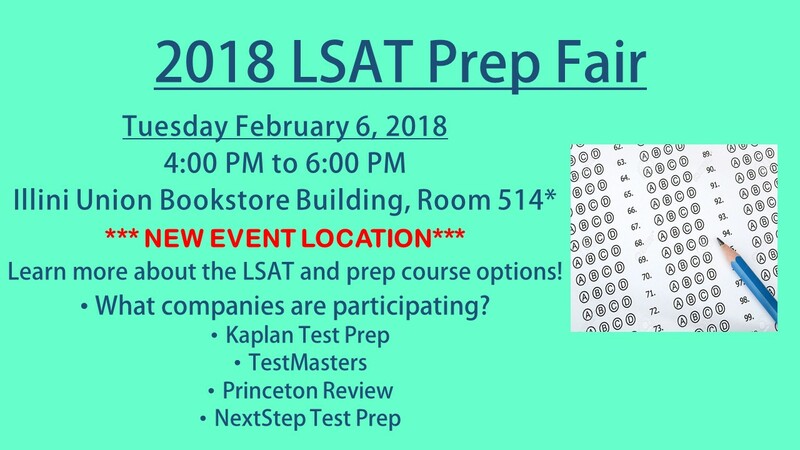 The LSAT Prep Fair’s attending companies will be providing more information about their courses, practice materials, possible discounts for their courses, and there will be the opportunity to win a free prep course! Taking the June 2018 LSAT? Do you need a study group to hold yourself accountable while you study and meet other students studying, too? Consider signing up for a LSAT study group. Use this link to sign up by Thursday February 1: https://goo.gl/forms/Cq1rIYBU5XtTSiIn1. *Pre-Law Advising Services does not endorse any specific LSAT prep company. There are great events this week for Pre-Law students! LSAT Preparation Fair — Tuesday, February 6! The PLAS-sponsored LSAT Preparation Fair is set for Tuesday, February 6, 2018, 4:00-6:00pm, Illini Union Rooms B&C! This event is a chance to learn more about several commercial LSAT test prep companies, participate in informative mini-workshops conducted by the companies and win discounts on test prep materials and scholarships for courses! To find out who is coming and see the workshop schedule, keep checking the PLAS website for updates on the fair. Whether you are taking the real Law School Admission Test in June (or later in 2018) or this is your first-ever baseline test, this is a great opportunity to take the LSAT in a testlike environment with a proctor. This practice opportunity features an actual, previously administered LSAT in a realistic, timed testing environment. Seating is limited. Test details and location will be emailed to registrants before the exam. Please register by clicking this link. Taking the June 2018 LSAT? Consider joining a LSAT Study Group. Use this link to sign up: https://goo.gl/forms/Cq1rIYBU5XtTSiIn1. Sign-ups close on Thursday February 1. Learn about job and internship opportunities on campus! Visit with campus units that are hiring students. Learn about services and work opportunities at The Career Center. Enhance your Illinois experience and build your resume. This event will include games, prizes and a chance to win a FREE Amazon Fire tablet! For information about other events and workshops at The Career Center, check out their spring calendar at: https://www.careercenter.illinois.edu/events. Now is a great time to update your resume, plan your job search or summer internship, and get to know their office and resources. The Career Center is currently recruiting enthusiastic, talented, and diverse undergraduate students to apply for our Career Services Paraprofessional (CSP) role for the 2018-2019 academic school year. The CSPs facilitate career-related workshops, resume, cover letter, and LinkedIn profile reviews, and promote The Career Center at events across campus. For more information, click here. Illinois Leadership Center will host several upcoming I-Programs. For more information and to register, visit their website here. The Office of Undergraduate Research (OUR) is now accepting submissions for the 2018 Undergraduate Research Symposium (URS), set for Thursday, April 19. Deadline for submitting an application to the URS is Friday, February 16, 2018, at 11:59 pm. The application can be found here. The URS is the signature event of Undergraduate Research Week (April 15-21), and brings together students, faculty, and staff from all disciplines on the University of Illinois at Urbana-Champaign campus, as well as corporate partners and sponsors, to learn more about undergraduate research and its potential to change the world. Students are encouraged to apply even if titles or abstracts have not yet been finalized – they can be edited. Just make sure the application is successfully submitted by February 16! The Office of Undergraduate Research announces its Spring 2018 calendar for the Getting Started in Research Workshop! The first open house is Thursday, January 25 from 3:30PM-5:30PM and the second open house is Friday, February 9 from 11:30AM-1:30PM. There will be a mini fair, resource tables, speed advising, and free coffee! Additionally, IAGE is putting on a “Funding Your Study Abroad Experience” workshop on Wednesday, January 31 from 4PM-5PM in Lincoln Hall 1090 with representatives from Illinois International Programs and the Office of Student Financial Aid. Interested in working in marketing or sales? Want to work for the Daily Illini newspaper or WPGU radio? Illini Media is hosting a recruiting event today from 7PM to 9PM in Gregory Hall, Room 112. Click here for more details. We hope you have been utilizing our 20 page Internship Newsletter over on our Pre-Law Compass page that we posted in December! (Click here for instructions on how to access our Compass page.) 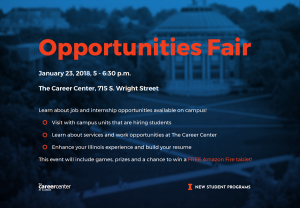 It’s got lots of job and internship listings for spring, summer and long-term opportunities from Champaign to D.C. and beyond. In addition, you should regularly check Handshake via the Career Center’s website to see if summer internships have been posted there. Undergrad PAID Internship at UIUC in Environmental Humanities for 2018-2019 Applications due March 1, 2018! The research group seeks three undergraduate interns who will work with the group on their seminars, workshops, and programs for the academic year 2018-2019. Interns will also work with the research group director, Professor Bob Morrissey, to develop their own research projects as well as a research symposium for undergraduates at the end of the spring semester. Interns will work approximately 10-11 hours per week, paid at the rate of $15.75 per hours, and will have $600 to support their research. Applicants must be juniors or seniors the year of the internship. For more information and to apply, go here. Remember: The application deadline is March 1! Please address questions to: Dr. Nancy Castro, at ncastro@illinois.edu. Paid Summer Internship at the Nuclear Energy Institute in Washington, D.C. Application Deadline is January 31! The Nuclear Energy Institute (NEI) in Washington, D.C., has a number of openings for paid interns beginning in the summer of 2018. The Nuclear Energy Institute (www.nei.org) is the policy organization of the nuclear energy and technologies industry and participates in both the national and global policy-making process. NEIs mission is to ensure the implementation of policies that promote the beneficial uses of nuclear energy and technologies in the United States and around the world. To that end, NEI works to establish unified industry positions on the regulatory aspects of generic operational and technical issues. NEI’s members include all entities licensed to operate commercial nuclear power plants in the United States, nuclear plant designers, architect/engineering firms, fuel fabrication facilities, nuclear materials licensees, and other organizations and entities involved in the nuclear energy industry. Interns at NEI will work with seasoned nuclear professionals in one of the following areas: technical, communications, policy development, government relations, legal, and member relations and corporate services on issues critical to the industry. Internships are 10 weeks and take place during the summer. Interns will be paid $15.00 an hour. All applicants must submit an application that includes the NEI Internship Application, a resume, and a copy of their transcript to resumes@nei.org. If requested, applicants must also participate in an interview either by phone or in person. Applications are being accepted for review between December 15, 2017 and January 31, 2018. Applications submitted beyond January 31, 2018 may be reviewed and accepted on a rolling basis thereafter. Click on this link for more information. https://www.nei.org/About-NEI/Employment-at-NEI/Internships. If you have additional questions about NEI’s Internship Program, please contact the NEI Human Resources Department at resumes@nei.org. The ABA Diversity Scholarship is designed for underrepresented students who demonstrate financial need and community involvement. Awards will be $15,000 for entering law students, which is renewable for years 2 and 3 of law school. Applicants must be entering law school in 2018 and submit an application, personal statement, and statement of financial need by March 2. Find the application and more details here. BARBRI Law Preview $10,000 Scholarship! BARBRI Law Preview and the Phi Alpha Delta Law Fraternity are offering a $10,000 scholarship to help pay for a student’s first year of law school. For more information, visit their website at https://lawpreview.barbri.com/10000-scholarship/. Chicago-Kent Honors Scholars Applications Due February 12! The applications for Chicago-Kent’s Honors Scholars Application are due Monday February 12! Candidates selected as Honors Scholars receive annual law school scholarships of full tuition. These awards have a total value of more than $130,000 over three years. You must complete the online Honors Scholars Program application. You must also complete the fall 2018 Chicago-Kent application for admission through the Law School Admission Council. For more information, visit their website: https://www.kentlaw.iit.edu/admissions/jd-program-admissions/apply-to-chicago-kent/honors-scholars-program. Diversity Law Day is dedicated to the idea that the legal profession must reflect the expanding diversity of our society.February 17, 2018 at the law school in Bloomington, Indiana.Diversity Law Day is free to attend, but registration is required for planning purposes. To attend, simply complete the registration form at www.law.indiana.edu/diversity-day. Contact Kendra Abercrombie at klabercr@indiana.edu or 812-855-2704 if you have any questions. As we first mentioned in several of our fall blog posts, many law schools host open houses for prospective applicants and all law schools strongly encourage students to visit their campuses. Note: spring semester is a time when many law schools will host events specifically for admitted students. Make sure you check the law school websites to see what types of events the schools in which you have an interest are offering. Listed below are upcoming events for three Illinois law schools. Chicago Kent Law School Open House, Saturday, January 27, 9:00am-2:00pm. For more information or to register, go here. DePaul University College of Law Open House, Saturday, January 20, 10:00am. For more information and to register, go here. John Marshall Law School Open House, Saturday, January 27, 9:00am-Noon. For more information or to register, go here. Northern Illinois University College of Law Open House, Saturday, January 27, Noon-4:30pm. For more information or to register, go here. Your Applications Are In — Now What? You finally submitted the last of your law school applications. Congratulations! (For those of you still working on applications, get them in ASAP!) After all of that frenetic activity you aren’t sure what to do next but you understand that you are now in a “wait and see” mode. Fast forward two weeks with no word on your applications. Should you start calling the admissions offices for a status check? NO! First — any follow up contact with law school admissions offices should wait a reasonable time, usually about 4-6 weeks from the date you submitted your application. The admissions review process is not like texting, folks. Allow people time to read, reflect and render a thoughtful decision! Second — the manner of checking in/follow up with admissions offices will be dictated by each individual law school. Check your LSAC CAS account and the law school’s website before doing anything! Did the law school provide a specific time-frame for a decision on your application? Did they direct applicants to a specific email for application status inquiries? Is there a phone number to call? Or, more importantly, have they clearly stated that you should only use your LSAC CAS status/tracking information? Whatever the case, ignoring directions will not help you in the quest for a successful application cycle. Read and do what the law schools ask! Next — when you do hear from the law schools, most of you will have good news in the form of acceptances. On average, UIUC seniors in the 2015-2016 application cycle received 4 offers of admission. That means you will likely have some choices and therefore some decisions to make. In addition, part of the admissions process will probably also include offers of scholarships. Therefore, now is the time for you to reflect on the schools to which you applied and consider how you view the schools and the price that you are willing and able to pay to attend law school. Note — the law schools are not the only source for scholarships. If you go to our Compass page, you can see a list of over 250 scholarships to help fund your legal education. These deans will be offering suggestions and insights into how applicants can have a respectful yet productive conversation that potentially results in more scholarship dollars being awarded. This is the ideal way to bolster your research about the next phase of the admissions cycle. So mark your calendars and make this event one of the final aspects of your evaluation process as you try to determine the right law school for you! Welcome back to spring semester! 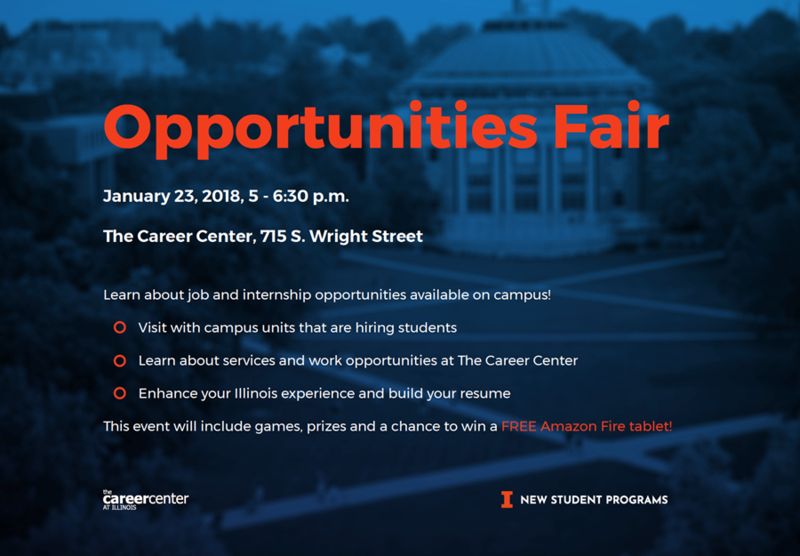 LOTS of excellent opportunities are coming up, including the Illini Union Winter Week of Welcome, campus events honoring MLK Day, paid internships, an internship with a local law firm and scholarships. Be sure to give this week’s blog a read! UIUC is hosting many events to celebrate the life of civil rights leader Martin Luther King Jr., including the Service of Celebration at Krannert on Sunday, January 14, starting at 5:00pm. Click on the following link to find out more. http://www.diversity.illinois.edu/mlk/calendar.html. The Illini Union is hosting the Winter Week of Welcome featuring all kinds of fun events this week and next week. Check out the listing here, and mark your calendars for the RSO Involvement Fair on Wednesday, January 24! Study Abroad – First Steps Info Sessions January 17 and 18! Not sure how to get started in the study abroad process? Attend a First Steps Info Session to learn what it means to study abroad, how to select a program, components of an application, and how study abroad can advance to your personal and academic goals. The Study Abroad Office will be holding their First Steps Info Session this week on Wednesday, January 17, 10-11am, and Thursday, January 18, 3-4pm. Both sessions will be held in the International Studies Building, Room 112. Go here for more information.